Dr. Mabuse: The woman. That woman! Q: Who wrote the score / what is the source of the music for Dr. Mabuse, der Spieler(1922) and how can I add it to my music collection? It is an interesting combination of classical and early jazz and I am interested in learning more. Thank you. 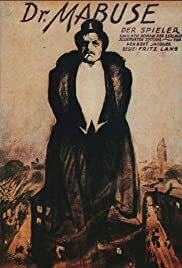 Part one of Fritz Lang's epic two part series as Dr. Mabuse making a potion that will allow him to rob people at the card table but soon one of his former victims and the State Attorney are hot on his trail. Needless to say, this thing is masterfully directed by Lang who builds the perfect underworld and allows a really beautiful and exciting film to take place. The cinematography is also brilliant and the performances are nice as well. There's a bit of a dry spot towards the end but the climax is perfectly executed to make way for part two. Part two of Lang's epic has Dr. Mabuse slowly coming unraveled. I found the first part of the film to be more entertaining overall but the ending to this part can't be topped as it shows Lang in an early stage doing something that would later be seen in M. The ending inside the tunnel and the follow up of Mabuse being "haunted" contains terrific atmosphere and manages to be quite creepy as well. However, the first part of this film really drags in spots mainly because the camera is taken off Mabuse and centers on the other characters, none of which are as interesting as Mabuse. With the two films running nearly four-hours, Lang manages to make a very impressive epic, although some of this could have used some editing.